This supplement clocks in at 34 pages, including nine pages of covers and legal matter, leaving us with 33 pages of content. 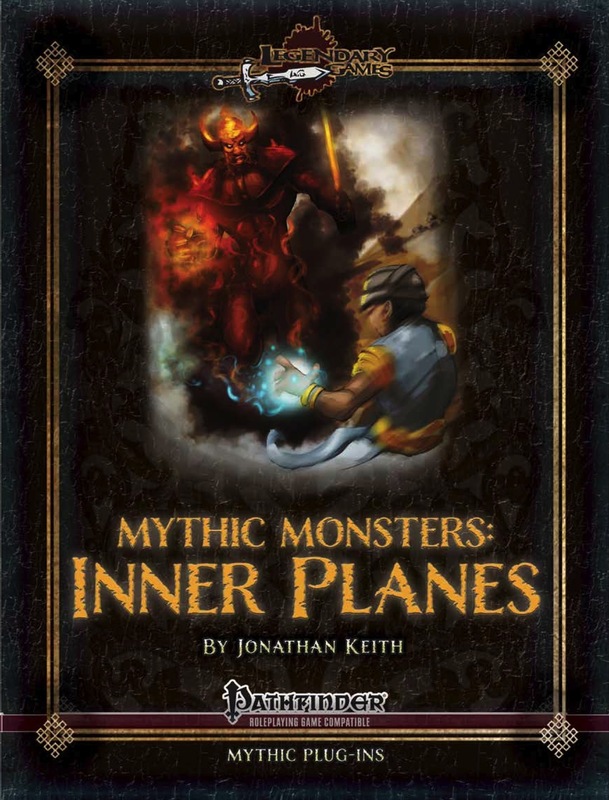 Each installment in Legendary Games’ Mythic Monster series contains 13-14 mythic monsters: one original and the others mythic versions of nonmythic creatures from previous Paizo and Legendary Games supplements. The mythic-ized old monsters’ entries consist almost entirely of crunch, with minimal fluff to describe their new abilities and no artwork. The new monster in each supplement comes with complete fluff and crunch, along with a full page, full color illustration. 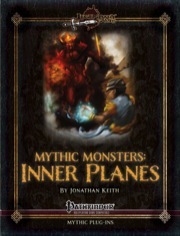 Additionally, each installment begins with a few mythic feats, path abilities, or new miscellaneous game mechanics related to the type of creature featured in the supplement. This installment starts by describing a campaign system called the portal code. The portal code consists of symbols which accompany planar portals that provide information about what lies on the other side to those with knowledge of the code. There is some description of how it can be used in a campaign, and illustrations of various sample planar code symbols. Next we get a discussion of genie-granted wishes in a mythic campaign. We are introduced to a mythic path ability possessed by all mythic genies: Wishmaster. This ability allows a mythic genie to revoke or alter the effects of any wish granted by another genie of its kind. It also gives the mythic genie knowledge of all wishes granted by genies of the same kind on the same plane and their outcomes, so it knows when to use this ability. Like the wish spell-like ability itself, this ability functions more as a plot device than anything else. Finally we get the CR 10/MR 4 Liminal Hound, an original dog-shaped monster with hexagonal scales and glowing joints. Among other abilities, it has the immunities of a construct (despite being an outsider), can fly through voids of space, and can latch on to enemies who plane shift, following them to their destination. It can also automatically use some divinations against a creature it has bitten. It is described as hunting down creatures who travel across planes. Also, if killed, its hide can be made into a Liminal Armor, a new 5000 gp magic item which gives the wearer knowledge of nearby planar portals. Sort Term Rating: The portal code may be something which requires time to work into a campaign, as does the wishmaster ability/plot-device. The one new magic item is easy to use, but only in a specific sort of campaign, and its effects are not as interesting as those of the monsters. For the five mythic genies, so much effort seems to have been put into making them good campaign or plot features that their use as simple monsters is neglected. To a certain extent, the other monsters here are also best used out-of-combat. They can still be put into a straightforward encounter, particularly the new Liminal Hound, but not as easily as you might expect from a Legendary Games bestiary. Hence, it comes in at a short term rating of 3.5/5. Long Term Rating: More than anything else, this is a book of plot devices. The monsters all have abilities which make them strong candidates for reoccurring NPCs. It’s not perfect, but there is a lot you can squeeze out of this book. Hence, it earns a long term rating of 4.5/5, rounded up to 5/5 due to the low price. This installment of Legendary Games' Mythic Monsters-series clocks in at 34 pages, 1 page front cover, 1 page editorial, 1 page SRD, 1 page ToC, 3 pages of introduction/how to use, 2 pages of advertisement, 1 page back cover, leaving us with 24 pages of content, so let's take a look! Now sometimes, a mythic monster installment features some cool, unique supplemental idea - this one provides a code of symbols (similar to what e.g. gypsies used back n the day, though much more obvious) for planar gates to help the wary planeshopper decide on whether to jump through the portal. Quite an array of solid, full-color glyphs with obvious meanings are provided here, covering e.g. the inner planes and negative/astral/ethereal planes, but also providing some symbols for portals that are one-way, lead to djinn, sahuagin etc. Nice. Now fans of cheesy horror classics may get a chuckle out of the nomenclature of the wishmaster ability for mythic djinn - those beings are the keepers of their races and essentially the wishing police - these beings may even undo the wishes of other djinn. Yeah! Now let's take a look at the respective mythic creatures and what sets them apart! At CR 10/MR 4, the Noble Djinni Vizier comes with a mastery of gravity and its manipulation, cannot be easily contained and gets some neat SPs. AT CR 12/Mr 5, the mythic Malik (i.e. noble efreeti) may cause non-mythic fire resistance ignoring conflagrations, shroud themselves in clouds of embers and are never blinded by smoke etc. - nasty for line of sight/effect tricks. Spell-like abilities powered by mythic power and the iconic arrogance also get neat signature abilities here. At CR 5/MR 2, mythic Janni actually are rather neat - they can change the elemental properties of magic items and spells they use via swift actions and summon forth powerful elemental support. The CR 14/MR 5 Noble Marid Shahzada may desiccate targets via water's fury and craft deadly prisons of ice. Their liquefying touch, insanely accurate senses under water as well as their utter superiority in the realms of underwater creatures ensure that these guys are awesome terrors to behold. The CR 16/MR 6 Noble Shaitan Pasha can force creatures to land, calling to swimmers and flyers - but what about those with a burrow speed? Apart from that oversight, the collective of cool legalistic wordsmithing, superior metalworking etc., a grand beast of a foe. Have I mentioned the ability to push targets into stone, melding them with the surroundings? Now that is creepy imagery. Mythic Ghuls at CR 6/MR 2 gets a cursed, special, selective cloud of obscuring mists as well as superiority over hyenas and hyena-like creatures and temporarily grant these subordinate pack creatures teamwork feats. At CR 9/ MR 3, the iconic invisible stalker gets the exceedingly cool ability to activate an electrical shield that damages targets depending on the amount of metal they wear and also use this field to see targets. Its nigh unstoppable tracking also helps make this one a full-blown success. The CR 6/MR 2 Mercanes come with a second extraplanar decoy chest and constant mind shielding, making them appropriate hagglers. Now mythic salamanders, at CR 8/MR 3 get imho one of the most iconic abilities - regeneration that can only be suppressed by mythic cold effects or weapons forged by their own mythic brethren - so simple, so elegant, so awesome. Of course, that are not all of their tricks, but it's the coolest in my book and rife with storytelling potential. At CR 6/MR 2, the Mythic Tojanida get toxic ink, which is a rather cool idea, especially considering the option to power to enhance the damage with mythic power. The dreaded mythic Xill at CR 8/MR 3 can abduct non-helpless targets, may implant eggs on targets grappled and may switch teamwork feats in a limited manner, adding a strange component to the creature appropriate for the dreaded creatures. Compared to that, making earth waves and bludgeoning earth-eruptions for mythic Xorns (at CR 8/ MR 3) feel a tad bit more conservative. Now my personal highlights in the mythic monster series tend to be Legendary Games' unique, new creatures and this time around, we get the CR 10/MR 4 Liminal Hound, a superb hunting dog of silverish hexagonally-scaled skin that not only is a glorious tracker, but which may also highjack grappled creatures trying to teleport away, interrupt those trying to get away, function perfectly in even zero gravity. As a nice bonus, we get a new armor made from their skin as well as a full-blown 1-page artwork of the most glorious quality. While not the best of Legendary Games' unique creations, I do like this critter's tight planeshopper-hunter-focus. Editing and formatting are good, I did not notice truly annoying glitches, though e.g. the Tojanida, Ghul, Malik and Genie-statblocks lack their respective ecology entries. Layout adheres to legendary Games' 2-column full-color standard and the pdf comes with two great full-color artworks and some cool symbols. The pdf has no bookmarks - a comfort detriment. Jonathan Keith delivers a fine array of elemental-themed adversaries, with a tight focus on all those non-elemental denizens of the often neglected Inner Planes. Indeed, the overall takes on the respective mythic creatures, often drawn from folklore and pop culture, can be considered iconic and the new mythic toys to play with are neat. On the other hand, even though the adversaries herein often have a rather unique additional tool (or even a whole array of them), not all blew me away. Add to that the minor glitches and we arrive at a good installment of the series, if not a perfect one - well worth a final verdict of 4 stars. And now that I have this I await the next in the line. Come on Abyssal...Oh, and this one is pure excellence. Glad you are enjoying. Review it up, my good Cat! There you go. Now where are my abyssal goodies? Thanks for the review, oh mighty CAT-THULHU, and in return, here are your mythic Abyssal goodies, either on our own webstore or right here at good ol' Paizo! One tries. Hope you enjoy the Abyssal goodne... I mean, BADNESS! Review cross-posted and linked on our website. Thanks again!